Portrait of Mr. Eddie MacAffer, Manager Bowmore Distillery. Mr Edward MacAffer has been making whisky with Bowmore Distillery since before men landed on the moon. In 2012, Whisky for Girls went to talk with him about his life, and his work there. Eddie was born in 1948, in his Grandmothers house in Shore Street. He joined the Merchant Navy in 1965, sailing between Greenock, Jamaica and British Guiana with cargoes of sugar. In May 1966 came the British Seamans strike. His boat was recalled to the UK. Upon reaching Liverpool, the crew were on strike. There was nothing doing, and no money to be made. Eddie flew home from Campbeltown as there were no service boats to Islay; fishing boats brought bread, newspapers and groceries. 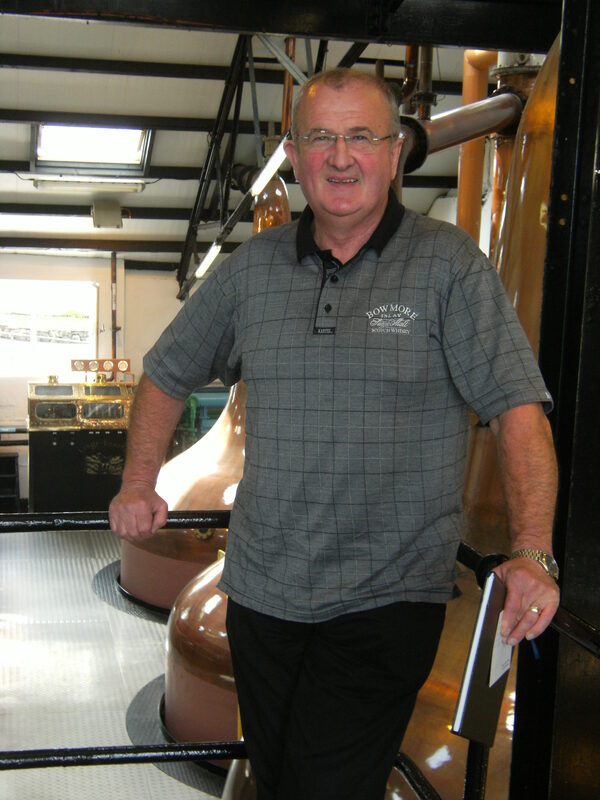 Eddie asked James McColl, the then manager of Bowmore Distillery for a job. James said he would give Eddie a job in the warehouse, but Eddie would need to work hard as James would pay him mens wages. When the strike ended Eddie got word to go back to sea ~ but by this time I had taken the job (in the distillery) so I told them I wasnt going back, he said. Sometimes. Sometimes, I regretted it when I was younger. But it wasnt meant to be. If it was, my life would have taken a different turn. So, I have been here for forty six years. Eddie has worked with guys who really knew what it was like to graft in a distillery. He worked with Willie Gilchrist, Sandy MacArthur, Davie Bell to name but a few. Working in the warehouse with them, they told him a lot about malting, about turning the barley by hand. There is a skill to it, it takes a while to learn. He listened to everything they told him. These guys worked in the days when it really was a hard job. Eddie told me he had no thought of being distillery manager. He was not brought up to think like that ~ you just wanted to be good at your job. Eddie was promoted to head warehouse man, head maltman, brewer, head distiller. He has worked right through, in every area of production and maturation ~ the only thing he hasnt done is clean the distillery holiday cottages ~ but he may get promotion to that one day..! I dont think any other distillery manager in Islay ~ or indeed Scotland, has experience of working in all areas of a distillery the way Eddie has. 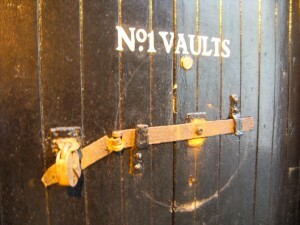 To be able to produce top quality spirit – but you have to be able to do it safely, Eddie said. Safety is paramount. Every part is very important, from malting through to the final spirit. I asked Eddie what difference he saw between distilling then and now. The biggest difference is wood quality, he told me. It was always good new make spirit, but, the quality of the wood that we now mature whisky in ~ in the industry as a whole, not just Morrison Bowmore, is much better than in the past. Morrison Bowmore Distillers have a policy implemented since the early 1990s to use only top quality wood for maturation. They spend more than four times the industry average on wood. Morrison Bowmore Distillers go personally to Kentucky and Herez in Spain to purchase casks. They chose, they pick out the ones they want. The casks are not sent over to Scotland unseen. Ten year old bourbon casks produce a maturation effect quite different from what you would have thirty years ago. Nowadays, there are aromas and flavours from the quality of the wood. Dried fruit from the sherry casks, bourbon casks give vanilla notes, a zesty, orange, lemony zing. Its not like in the old days where you would take the dram for effect and chase it with anything you could to get rid of the taste of it! In the past, most of what Bowmore produced was for blending, for Chivas Regal, for Bells of Perth. Not much money changed hands, Eddie said. We did what was called Reciprocal Fillings ~ we gave them whisky and they reciprocated with spirit for us to use in blending our Rob Roy. 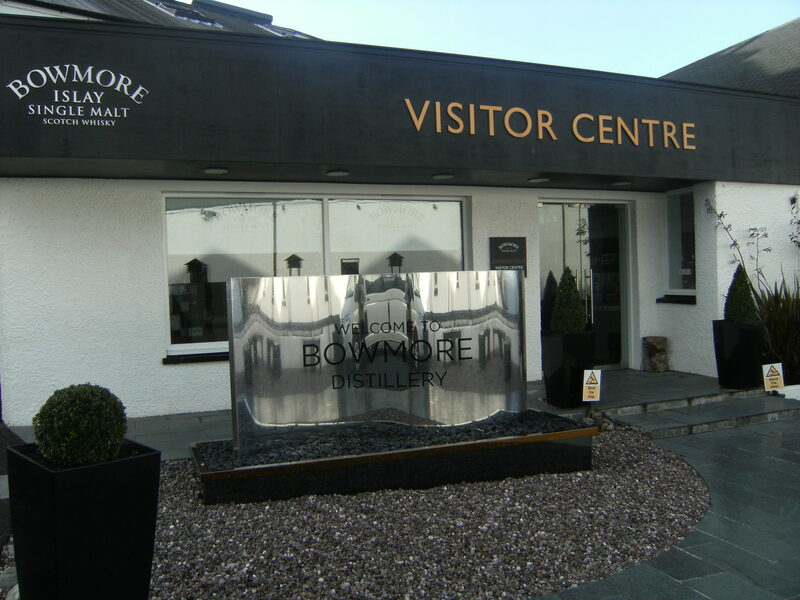 Now, Bowmore Distillery only produces single malt for their own use. Also, the big difference today is there are only 14 men working in the distillery. When Eddie started there were 30 men. The job is not quite as physical as it was thirty years ago. However, you still have to work a bit in the malt barns ~ even though there are the electric malt turning machines. But, Bowmore Distillery is not too modern, computers dont run it. There are things like air operated valves, so the men dont physically dont have to go and turn every valve, but they still have to watch the mash filling and so on, and keep an eye on what is happening. I asked Eddie what places he saw available for women in the industry. He told me; What I have found personally is that women have a very good nose. Women are very good at nosing whisky. Female members of staff are very competent at that. Every week in the distillery there is nosing of our own new make spirit to compare it to what we call the composite (the established structure and profile of Bowmores NMS, the standard spirit profile they are aiming to create constantly) Six or seven people will nose it every time, whoever is in the distillery will nose it. You mark your score down on a graph, and the charts are put up on the wall to let everybody know how close it is to the composite. Also, a sample goes to the nosing panel in Glasgow, and they carry out the same procedure. Every week you are rooting the spirit with the staff ~ some may not be that involved with the production, but each week everyone is connected to the actual thing we are creating. In the 60s and 70s all the workers had their dram at the end of the day, people were connected to the product by that. Nowadays we dont have the drinking ~ but we keep the connection through the nosing. What makes a great dram? I asked. A workforce. A well skilled workforce who are interested and dedicated, Eddie told me. At Bowmore, it takes fourteen days to produce a dram from start to finish ~ from malting the barley straight through to the end product. Then, it goes into top quality wood, then, the stewardship of the spirit in the warehouses from 8 years to 20 years and beyond. Eddie said because they are using better quality wood to store the spirit, maturation is continuing longer ~ in the past, you were lucky to get good, old whisky. It was more a case of luck in the maturation stage what came out at the end. Now you have a better control and guarantee in relation to the end product. What advice can you give Whisky for Girls? I asked. You girls have got a great nose for whisky, he said. Educate yourself by drinking single malts ~ Auchentoshan is as good a starting point as any. Start with that type of whisky. (Auchentoshan is the triple distilled, unpeated Lowland distillery owned by Morrison Bowmore Distillers) Also, we have very well balanced whisky at Bowmore. Experience all the lovely flavours that come from the 25 30 ppm (parts per million of phenol content, which means the level of peatiness of the dram) on the grain itself. For a contrast Laphroaig is 45 50 ppm on the grain, with Ardbeg being nearer 60 ppm. Dont be frightened to let everyone know what you are thinking. Everyones nose is different. Say what you experience, write it down. Who knows who may read it somewhere and say, Ill remember that! Yes, it is my dream job. I was absolutely amazed when I was asked if I would be distillery manager. I was effectively running the place for a while, previously, but when I was asked if I would like to be made up to Manager, there must have been silence from my end of the phone, because I heard a voice asking ~ Are you still there?? It is a dream come true, a great feeling. I sometimes stand in the street and look up at the place and say to myself, Thats Bowmore Distillery.. (and) Im the manager. It gives me a great sense of pride. I only wish my Mother was here to see it. It is also good from the respect that the last four managers of the place, Percy, Islay and James ~ and now myself, the fourth and present manager are all guys from Bowmore ~ that the last four Managers of Bowmore Distillery are Bowmore boys. Mr. Eddie MacAffer ~ Ileach, Distillery Manager, Gentleman.